Delighted Stourbridge boss Gary Hackett hailed his team after a ‘fabulous night’ as they knocked the Cobblers out of the FA Cup - and took a swipe at the BBC for not broadcasting the game on television. 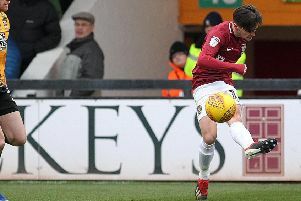 The Glassboys set up a third round date with Wycombe Wanderers as Jack Duggan’s 86th-minute winner sealed a 1-0 victory over Rob Page’s men, and Hackett was a very proud man. Talking to the media while 100s of Stourbridge fans celebrated their big night on the pitch, Hackett said: “It is just one of those fabulous nights. And then the manager of the lowest-ranked team in the competition took aim at the BBC for not scheduling the date against the Cobblers for live coverage. “Maybe the BBC should have a look at us,” said the Glassboys boss. “They have ignored us permanently over a long period of time. They didn’t think we could beat Northampton but the better side won. “They (the BBC) didn’t believe we could do it. They should have been down here. We are the lowest-ranked team in the competition and we have been ignored. “Maybe we can have a bit of a giggle now. We have done it. We are in the third round. It is an amazing occasion. We will probably take 1,000 to 1,500 fans to Wycombe. It will be a big day. “I have been here with (assistant boss) Jon Ford for a number of years and this is the biggest yet. I still don’t think we will get enough credit.